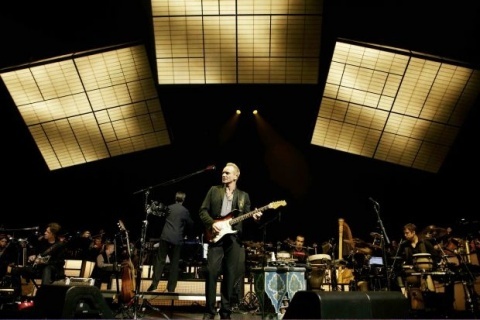 It seems as if there always comes a time in the life of a rock band or pop artist to team up with a symphony orchestra. Usually this involves re-arranging songs for strings, winds, and percussion. Move over electric guitar, bass and drums: we’re going classical. Recently I saw Peter Gabriel perform with an orchestra on David Letterman. Gabriel was singing an old hit “Red Rain” (1986) and as I listened I tried to find something in this new version that improved on the old. The original track, by the way, had been meticulously assembled in the studio with top flight musicians to create a dense soundscape that was unusual for pop music at the time. The new orchestral arrangement seems a little stiff in comparison. These kinds of rock/pop-orchestral collaborations highlight two musical facts. First, pop melodies are generally different beasts from classical ones. They tend to be short and simple in structure, and rely on insistent repetition to achieve their affect. Also, they’re not usually polyphonic or lushly harmonized. This means that the orchestra’s vast instrumental resources are often wasted on pop melody’s more austere demands. Second, the orchestra and the pop music outfit are entirely different timbral beasts as well. The sonic profile of say, a string section playing unison long tones of fourths and fifths is different from an electric guitarist playing a “power chord” of fourths and fifths through a distortion pedal and an amplifier. And so timbre is not merely a musical parameter: the same notes played on different instruments can make us feel very differently. Maybe this is why pop music played by orchestras can sound limp. What we come away with after listening to these pop-classical encounters is that, whatever the musicians’ motivations, it can only be a good thing for the popular and classical idioms to continue to get to know one another, revealing each other’s sound tendencies, aesthetics, constraints and ability to make us feel something. Nice. I thought one outfit that “got it right” was the Kasmir record, the Zeppelin orchestration done by the London Symphony Orchestra. Zeps sound often aimed for grandeur and the orchestra got that, though it some parts, say during the crescendo of Stairway the orchestra seemed a little thin, didn’t quit get there, but some songs really translate well. I wish they’d taken a crack at Ten Years Gone. I just took a listen and have to agree with you. There’s also an orchestra-only version (London Symphony) on YouTube which works well. There’s enough detail in the original song that it translates well to the classical orchestration. Thanks for reading.